Yes I am back at last but suffering from a good dose of jet lag after 43 hours of travel, so don’t expect too much from me today. Well boy did he repeatedly whisper that quote in my ear with sarcastic humour over and over again during our vacation. Especially in the narrow alley-ways of Venezia (Venice) and while watching people trying to drag large hard shell suitcases down narrow train isles. I remember one particular man who scrambled last minute onto a packed train with just this type of suitcase and a backpack stuffed to bursting point and saying to his wife while trying to tug the thing down the isle while juggling the other “this is impossible”. I got the feeling he thought the problem was with the train and not with all the unnecessary luggage they were carrying. My husband and I just looked at each other with smug satisfaction and patted our faithful Rick Steves’ backpacks and rejoiced in our minimalist travel skills. I weighed my backpack just now to see what I was carrying and it weighed in at a mere 11lb (5kg). We did off load and use up a few items as we went along but at most I would say it would have weighted only a couple of pound more. We never once had to check our baggage which saved us untold time in airports and there was always enough space in the overhead locker on the planes as our two bags packed into the same size space as one normal carry-on bag. We also only had to wash every 5 days which didn’t pose any problems as our Rick Steves’ guide book usually tells us where to find laundromats in all the places we stayed. A little pre planning helps with this as some places have less facilities for this than others. We actually find it relaxing to spend a couple of hours every now and again sitting chatting and reading while the laundry is taking place. We were amused when one laundromat had a drinks dispenser that you could get a beer from. I will elaborate more on this subject in the future but between the jet lag and the three phone calls from my daughter who has been suffering from not being able to talk to her mummy everyday for the last month, I just haven’t enough brain power left to put the words together. Gone as far as I can go with these puzzle books so it’s time for the trash. I actually had a 2nd copy of the blue one that I took on vacation with me and it is now used up on in the recycling in Italy somewhere. thanks mate. I am sure I will get used to the idea soon. Welcome home. I’m proud of you and your smart packing. I know how you feel when you go somewhere and watch others struggle or have them knock you in the head or other body part with all their stuff. My mom and my friend both way over pack. Drives me nuts. I went to a 3-day/night scrapbook escape with a carry on for clothes, etc, and a small bag of craft tools. My friend took two suitcases, a carry on, a huge scrapbook case and a smaller one. WHAT!!!! She could have done the same as I did. I even had scrapbook tools I oculd have left at home but had followed the recommendations of the event. thank you for the welcome home. I keep waking up wondering where I am which is odd because that didn’t happen once in the previous four weeks when I was actually waking up in strange places. That quote about packing heavier that my husband loves so much seems to not sink into some peoples head. They must either travel heavy all the time and it never occurs to them to pack lighter or they think they can’t do wiithout all the clutter they carry. I think most of that clutter comes down to vanity but I will write about that another day. Forgot something. 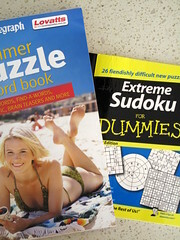 I buy puzzle books & tear out the page as I complete them and throw them in the recycle. I know, I’m weird. Welcome back. Yes, packing light is the best! It makes everything easier all along the way of your trip, and frees you up to enjoy yourself. And it inhibits you from buying new clutter on the trip, since you can’t carry it back in that small suitcase. thanks for the welcome home. I am still a little dopey this morning but I am sure I will improve after a couple on good night sleeeps. Mmm…Venezia is one of my favorite places! Luckily, having an Italian husband who currently has all of his family living in Italy, we make it back there every few years. my husband wrote the post about travelling light on Day 250 and I must admit I haven’t even read it yet because I was so busy trying to wrote the other 28 posts I needed to fill the month with while I was away. I will have to go back and read it see how well we lived up to what he wrote and what new lessons we learned along the way on this vacation. I think the biggest trick to packing light and ease up on the vanity. You know, don’t be too concerned with how you look when you travel. Oh, Robin, I almost forgot to say welcome to my blog. I see you haven’t left a comment before or at least not with this ID so if you are new you are most welcome here and please drop in with a comment as often as you like. Welcome home! I so understand the huge bags people try to carry on vacations and overnights. It makes me crazy to see the big bags and extra carry ons that get lugged around. I’m on a weekend trip right now and other than my knitting bag everything is in one 20 in rolling bag which is not at all full. Because we’re in the car I can have extra knitting with me. Isn’t Rick Steves great ? thank you for the welcome, I need it right now. The jet lag is still troubling me so my head is a little fuzzy but I am getting there. We play “Spot the Rick Steve’s travellers” when we are on vacation and there are a lot of them out there. It is good to see people going it alone instead of taking the predictable travel tours everywhere they go. A little individuallity goes a long way when it comes to travel. Welcome back, I am hoping to stay with you, but still, too many spelling and grammatical errors. I am not being a jerk, I am telling you something really important, so you can get to the next level. You have a great idea and a good spirit that comes through. I am sorry to continually disturb you with my spelling and grammar issues. I really do try to get that correct with my husbands help, but I am who I am and was never very good with English at school. Actually, I hated it and nothing bothered me more than having to read out load in class because I was not a good reader. I would like to point out too that I am Australian and even though I am sure the odd incorrect spelling does sneak around my husband and spell check, we do spell in the Queens English here in Australia. This includes words like colour, humour, honour, aluminium (English) while color, humor, honor, aluminum, are American adaptations, just to name a few. I also tend to mix up the spelling at times because I spend seven and a half years living in Seattle so the spelling gets a little confused there. As for my slang and the way in which I word things that is just me I am afraid. I write from the heart, the way in which I think and I make no excuse for that. I did mention that we were still suffering from jet lack yesterday and not to expect too much so please stick with me though and I will try to be more careful in future. Although, just trying to produce a post everyday can be a big enough challenge on its own. Just want to say I love how you write. I always feel like I’m sitting at the kitchen table chatting with you over a pot of tea. And yay for the Queen’s English from here in Canada! I just wish it was spring here as well – but we’ve just crossed into autumn … ah well, turn and turn about is fair, I guess! I see you have been reading the comments. Thank you soo much for your support. I like the idea of sitting at the kithen table having a chat with you over a pot of tea. We cheated the seasons a little by going to Italy and enjoying the last of their summer while missing the last bit of the cooler whether here. @ Colleen-welcome back! Glad you had a great trip-Just keep writing–we love you. thank you for the warm welcome back and your support. Don’t be too hard on Rachelle everyone has there thing the they can’t tolerate I know I do. Mine are selfishmess, laziness, inconsideration, excess vanity and the list goes on so I am no saint either. Welcome back to spring and Australian spelling dear! thanks mate, you’re a champion. Welcome home. Hopefully you can get some needed rest to be on the right ‘time-zone’! I traveled (for a three week stay) from Germany to Southern California w/ two small children and three backpacks. NO LUGGAGE! Traveling light is AWESOME (and w/ kids in tow, much EASIER!)! This afternoon we went to a neighborhood flee market. There was so much JUNK! (or maybe someone elses ‘treasures’!) for sale. It made me feel very sick to my tummy to see all the ‘stuff’ people were trying to sell. I just kept thinking in my mind WHY DID THEY BUY THAT IN THE FIRST PLACE? We only went to the event to see friends (they had a booth for kids to do art projects). I was glad to leave that place empty handed! Yahoo – we love being minimalists! nice to hear from you. I am glad you have learned to travel light. It is the only way to fly that’s for sure. We had a funny moment when we were leaving to come home. My husband’s bag was heavier than mine because he was carrying the electronic gear which can be wiehgtly. He said to me “I don’t understand why my bag looks bulkier than yours because even though it is heavier there isn’t any more volume in it”. He had forgotten that he actually chose to buy the larger of the two Rick Steves bags that were available at the time that we purchased them. When I pointed this out he has quite bemused and I am not sure he believed me. I think he will probably was our son’s bag the next time we travel. One good thing about the fleamarket is that at least the people were trying to sell their stuff on rather than just sending it to the tip or hoarding it in their houses. If only they had learned from the experience and don’t replace the stuff with other useless stuff which is the only solution to not reclutter. Thanks for all you did before and during your trip to make sure we had reading material while you were away – it can’t have been easy to do. Hope you are feeling yourself again in short order! thank you for the welcome back. I must admit being able to write my blog again and reading and answering the comments is one of the better parts of being home. It is 8:45am and I only just got out of bed so hopefully the extra sleep will help get rid of the jet lag. I’m afraid to admit, that I have been one of those tragic overseas travellers: I think I’m the ONLY person in history to have ‘backpacked’ around Europe (for 6 weeks) with a SUITCASE. It was bloody heavy and unwieldy!! My only excuse was that I was staying with relatives after the backpacking and had presents for them all – but I should have just sent it on ahead and had a backpack, durrr!! it’s good to here from you, I have been wondering how you have been doing. Thanks for the welcome back, I am spending the morning cleaning house. My son did a reasonable job of having it cleanish when I got home but that really only makes me a little suspicious especially since it is mostly the living area that is clean. There appears to be nothing broken (expect a kitchen plate) or missing so that is the main thing. As for your tragic packing on your last trip, I assume you have learned your lesson and will do better next time. lol!! By the way, if you are ever in the Newcastle area you had better let me know you are here and we can get together for a cuppa and a chat. Oh, I thought you were in Qld for some reason! Thanks very much, the same offer goes for you if you are ever in Melbourne – seriously. I met a few bloggers in my blogging days, and every one of them was just lovely. We’re going to FNQ in a couple of weeks and I’d love to just take carry on luggage, but my husband is taking his golf clubs, so there isn’t much point, rats. Never mind, I’m sure I can fit the kids’ and my stuff in one suitcase anyway! I was born and grew up in Qld and my children are also Queenlanders by birth so you weren’t far off. Hi Colleen, Welcome back! Sounds like you had a great time and a well-deserved rest. But doesn’t it feel good to be home again? I am proud to say that my husband and I shared a sports bag with one large compartment and two small ones attached to each end when we went on a four-day trip this past weekend. It was great not having a lot of stuff. I usually tend to pack in “just in case” mode, but not this time. Thanks for the warm welcome. We did have a great time thank you and I must admit there are some nice advantages to being home again. Good for you and your light packing effort on your recent trip. Those just in case items really do take up a lot on space and add a lot of weight. We had to buy two umbrellas during our trip which we did end up using a few time. They only cost us 2.50 euro each and we had to repair them a couple of times so we felt we got our money’s worth out of them and left them in Rome for someone else to use.